Hollywood A-list actor and now stage impresario of The Old Vic. I have admired the man since I first saw him in 1995’s The Usual Suspects. Not convinced? Righto, check him out again in Se7en, that might change your mind. No? Not doing anything for you? What about L.A. Confidential? Nothing still? Did you at least like his portrayal of Lex Luthor in the last Superman film? If that doesn’t do anything for you still, then perhaps you need to head off my neck of the woods, try and finagle seats for a revival of David Mamet’s Speed the Plow and then maybe that will change your mind. Now, why am I on about Spacey at the moment? Sure he’s got a new film coming out this week but since I have momentarily stayed away from the cinema in favour of the theatre in the last couple of months, this rant really has more to do with the fact that he has raised the alarm bells quite loud this week after criticizing the BBC’s unfair promotion by way of talent shows of West End musicals at the expense of other productions, and you know what, I think he is ABSOLUTELY right. The talent search show in question is I’d Do Anything which is a search for the actress who will play Nancy in the revival of the musical Oliver! which followed on from Any Dream Will Do, which was a search for the lead in the new production of Joseph and the Amazing Technicolor Dreamcoat and How Do You Solve A Problem Like Maria? in which contestants vied to star as Maria in The Sound of Music. Both musicals are produced by the Really Useful Group, owned by Andrew Lloyd-Webber, who has been a judge on all three series. Oliver! is a Cameron Mackintosh production, but is due to be staged at the Theatre Royal, Drury Lane, owned by the Really Useful Group. 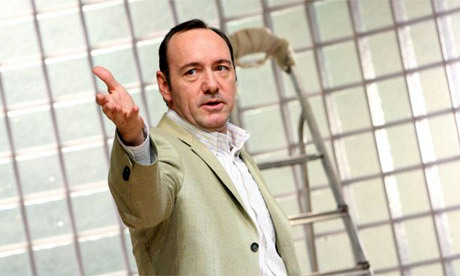 I have already expressed my own thoughts of this in one of my discussion groups in Facebook and it may not be the same as what Spacey here has pointed out, but apart from this idea of bringing in a new audience to the theatre by way of talent shows, or casting possible recruits in some soap opera first (e.g., Sound of Music’s Summer Strallen who was previously in Hollyoaks) to get a fanbase, although clever is really more about cheap gimmickry. I am cringing just watching the Oliver! auditions to cast the Nancy character. PLOT: Josie (Eve Best), a towering woman with a quick tongue and a ruined reputation lives in a dilapidated Connecticut farmhouse with her conniving father, Phil Hogan (Colm Meaney). Together they’re a formidable force as they scrape together a livelihood. But Josie’s softer side is exposed through her love of Jim Tyrone (Kevin Spacey), Hogan’s landlord and drinking buddy – a third rate actor whose dreams of stardom were washed away by alcohol. A drama in four acts, ‘A Moon for the Misbegotten’ was written in 1943 and first performed in New York City in 1957. Until Colleen Dewhurst and Jason Robards’ celebrated performances in the 1973 production, it was a neglected piece viewed largely as a postscript to his masterpiece, Long Day’s Journey into Night. It was in fact forged from an episode in the first act of that play, focusing on the oldest Tyrone son, an alcoholic actor. Director Howard Davies is reunited with Kevin Spacey, for Eugene O’Neill’s “A Moon for the Misbegotten”, their first project together since their award-winning success with another O’Neill classic, “The Iceman Cometh”. It was my first time ever at the Old Vic, although I meant to watch a few of their production since Spacey took over as artistic director in 2004. Never mind, no love lost for sure. As it was within the first week of showing that we decided to catch Moon, and the press night is to follow a few more days later, there are no reviews available just yet, but I have faith, faith that I will enjoy tonight’s performance and will beat myself up for having to wait too long to watch Mr. Spacey up close. And he didnt disappoint. This is not an easy play to watch, it’s written by American playwright Eugene O’ Neill who also gave us The Iceman Cometh and A Long Days Journey into the Night. It’s a night of catharsis which you will have a lot of watching this brilliant “minor masterpiece” as Spacey himself said. According to the Daily Telegraph, ‘Eve Best is perhaps the finest actress of her generation, gives one of the most beautiful accounts of aching, unconditional love I have ever seen’. So what about Mr. Spacey? Like I said in the outset, he didnt disappoint. He was as superb as he has always been and I promise him this, I will see more of his production at the Old Vic in the days to come. Playing at The Old Vic until 23 December 06.